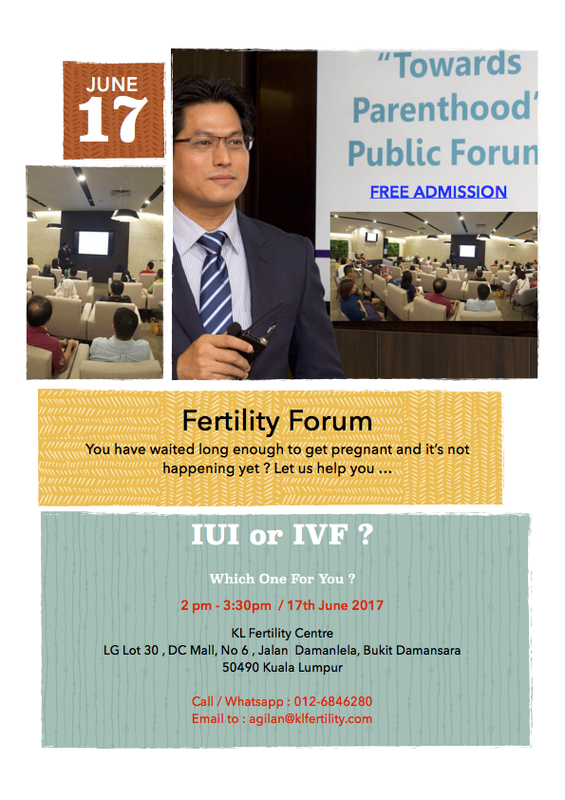 Fertility Forum : IUI or IVF ? To register , please whatsapp or call : 012- 684 6280 / 03 27804288. You can also visit www.klfertility.com for registration or email to : agilan@klfertility.com. You have waited long enough for pregnancy and it’s not happening yet ? Let us help you. Attend our forum and we will guide you towards your motherhood. Dr Agilan, I am interested to attend your forum of IVF on 17.06.17. Please include my name and my husband name. Kalpana ChandraRaj Khanna Perimparajah Thank you. Hi, I would like to book a place for this forum. Please do advice on the next step. Hi. Thank you for your interest in my forum. Kindly email me your name and h/p no to : agilan@klfertility.com . Thank you. Thanks for sharing the best articles. I am satisfied with your site and your postings they very nice and very help us. I read your-your articles and you gave us such a good tips and suggestions. you made a good site and it has such a great information on this topic.